How do I remove Shogun code from my Shopify theme? Steps on how to remove files and code after uninstalling Shogun. Shogun lets you keep all of your pages and changes after you uninstall our app. Because of this, some Shogun files & code will remain in your theme to ensure the saved content will continue to display correctly. If you plan to keep your Shogun content after uninstalling, it is recommended to leave the code in your theme to ensure the pages remain functional. If you've published any content using Shogun, there will also be some Shogun HTML in the content fields of the store's pages. It is recommended to remove that content before beginning this process. The Undo Import feature can be used to remove Shogun content. 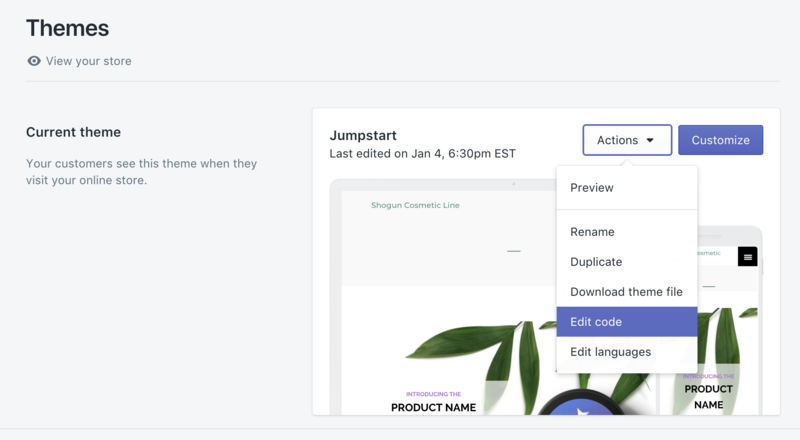 If you do not have any active Shogun content and would like to completely remove all Shogun code from your Shopify theme, you can follow the steps below. If you have used Shogun to replace your storefront's homepage, there will be Shogun code in the index.liquid file of the theme. We recommend using the Unset Homepage option to roll back to the theme's original version. Fair Warning: If you have any active Shogun pages, following these steps may cause those pages to malfunction. Go to the Themes section of your Shopify dashboard. Click on the Actions button next to your active theme and select Edit Code. There are just a few lines of code and some files that need to be removed. Let's remove the code first.